If you want to make your very own Crab Cakes or appetizer size crab puffs, this Crab Cake Mix is what you need! 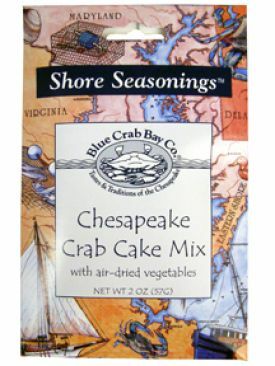 This special mix contains cracker crumbs seasoned with our Chesapeake Bay Seasoning and air-dried red bell peppers, carrots, celery, tomatoes and leeks. Simply add fresh crabmeat, an egg and a little mayonnaise and saut� or broil. Easy recipe on back of packet. You also can substitute cooked flaked fish and make fish cakes. Packet makes two to four crab cakes depending on the size or 10 to 12 mini crab cakes or puffs. 2 oz.